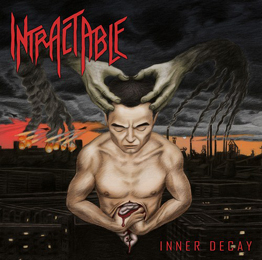 Intractable are a Swiss quartet (Benjamin Kottmann-v, d; guitar players Markus Hospenthal and Dominik Meier; Michael Schuler-b). The band was formed in 2006 and released a first demo (with the title First Eruption) about two and a half year ago. In mean time, they shared stage with known acts like Skeleton Witch, Gurd and Warbringer, and during the second half of 2012, Intractable finalised the recording of their debut full length, Inner Decay. The album lasts for more than fifty five minutes and brings nothing but predictable and un-original but, at the same time, extremely convincing and strong Thrash-edged Death Metal. That’s such a difficult case again, because at the one hand we are currently dealing with an overcrowded scene, yet at the other Intractable are one of those acts that is worth spending your money at (or worth taking the risk stealing it from a weak and naïve long-haired victim…). Inner Decay comes rather rhythmic, technical and with a speed balancing in between slow and mid-tempo. It has nothing ‘special’ to add, yet the performance is more than ‘just decent’. These guys are proud to handle their instruments, I can hear, and the compositions have been written with persuasion and the best intentions. Appreciable are the tempo-changes (a perfect balance and with inclusion of well-thought transitions), the rhythm section (ultra-heavy, even though Intractable for sure aren’t the most brutal act from Switzerland), the nice leads and solos, the Thrash-injections (several riffs! ), and the neat, yet not clinically tidy, production (studio registration has been done entirely by guitar player Markus, by the way, at the KHE Recording Studio).